So you think you know the Bible? 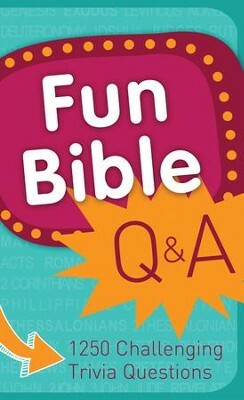 Prove it—with the entertaining, wide-ranging, 1250-question quiz book Fun Bible Q & A! With questions drawn from both the Old and New Testaments, and presented in multiple choice, true/false, fill-in-the-blank, matching, and open-ended formats, Fun Bible Q & A will test your knowledge of all things scriptural: What high priest did Paul call a “whitewashed wall”? What mountain chain was the final stopping point for Noah’s ark? What five books of the Bible have only one chapter? Only 1247 questions to go. . .don’t miss the fun! I'm the author/artist and I want to review Fun Bible Q & A: 1250 Challenging Trivia Questions - eBook.